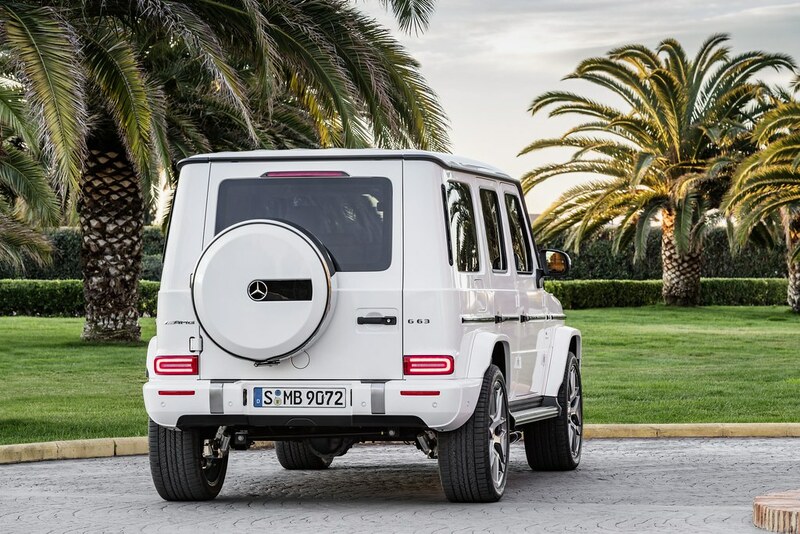 With the new Mercedes-AMG G 63 (combined fuel consumption: 13.2 l/100 km; combined CO2 emissions: 299 g/km), the Mercedes-AMG G-Class has undergone the greatest change in its history – while remaining true to its well-proven virtues. 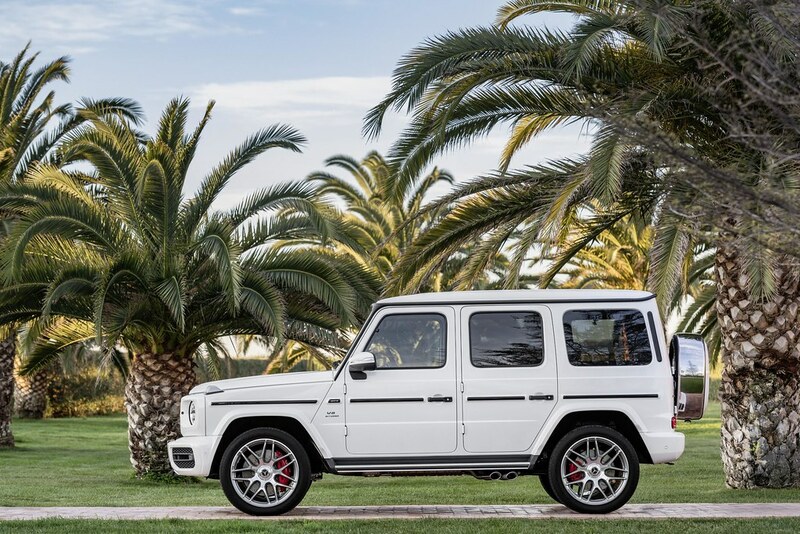 The G 63 underpins its unique position among performance off-road vehicles with the powerful drive system, the newly developed AMG RIDE CONTROL suspension, the AMG-specific transmission modes and the new interior with widescreen cockpit. The basis for the hallmark AMG Driving Performance both on and off metalled roads is provided by the 430 kW (585 hp) 4.0-litre V8 biturbo engine, the rear-biased all-wheel drive (40:60) with three differential locks, the extremely fast-shifting 9-speed automatic transmission, the double wishbone independent front suspension and the adaptive adjustable damping. The reinterpretation of the unmistakable design creates strong highlights with the AMG-specific radiator grille, flared wheel arches, striking side pipes on the exhaust system and the up to 22-inch wheels. 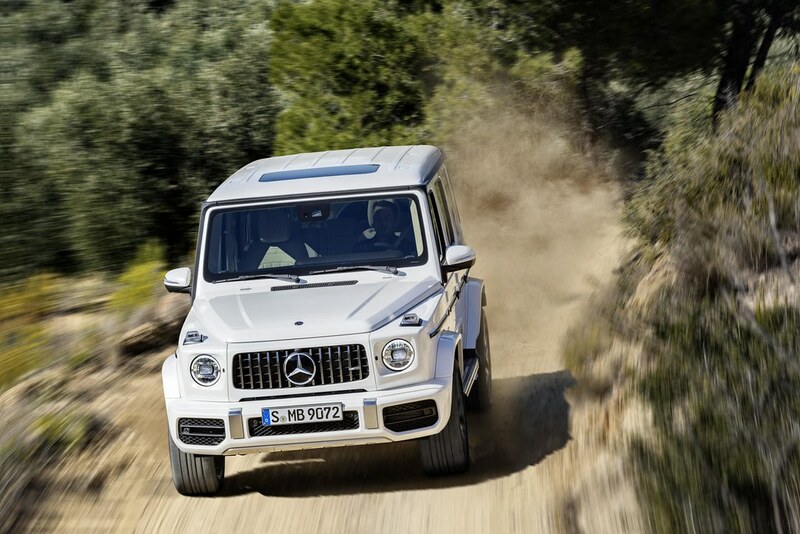 The AMG 4.0-litre V8 biturbo engine now also replaces the previous 5.5-litre V8 biturbo engine in the G 63. It generates 430 kW (585 hp) in this model, and delivers a maximum torque of 850 Nm. This is available across a wide rev range between 2,500 and 3,500 rpm, and provides a sense of effortless superiority. It absolves a sprint from zero to 62 mph100 km/h in 4.5 seconds. This dynamic performance is maintained up to the limited maximum speed of 220 km/h, or 240 km/h with the AMG Driver‘s package. For more efficiency, Mercedes-AMG has equipped the V8 engine in the G 63 with the AMG Cylinder Management cylinder deactivation system. In the partial-load range, cylinders two, three, five and eight are deactivated, which significantly lowers the fuel consumption. The combined fuel consumption is 13.2 l/100 km, and the combined CO2 emissions 299 g/km. When the driver has selected the “Comfort” transmission driving mode, the cylinder deactivation system is available in the wide engine speed range from 1000 to 3250 rpm. The AMG main menu on the instrument cluster informs the driver whether the cylinder deactivation system is in use and whether the engine is presently operating in the partial or full-load range. The transition from four to eight-cylinder operation is fast and imperceptible, so that the passengers do not experience any loss of comfort whatsoever. The wide ratio spread allows a choice of a very sporty or a very comfortable and efficient driving experience. 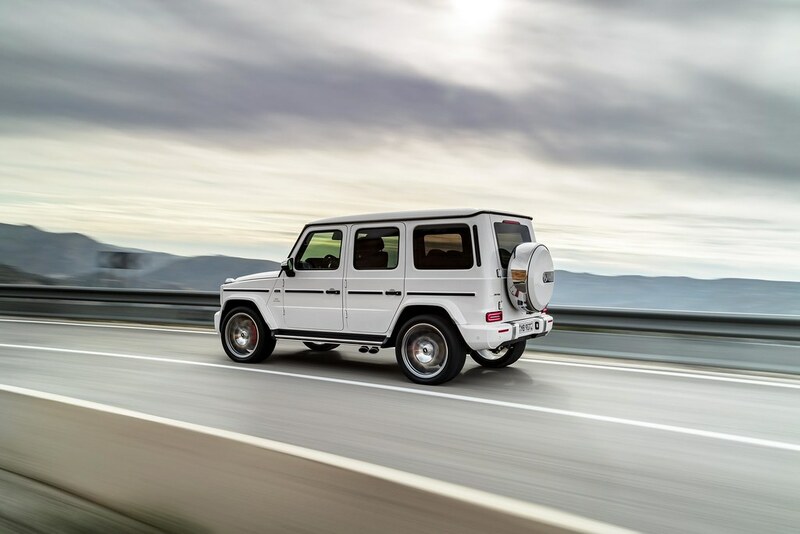 In all transmission modes the G 63 moves off in first gear so as to ensure a dynamic sprint from a standstill whenever required. The DIRECT SELECT lever has been repositioned as a steering column stalk. The off-road reduction gear has been developed further for operations on difficult terrain. 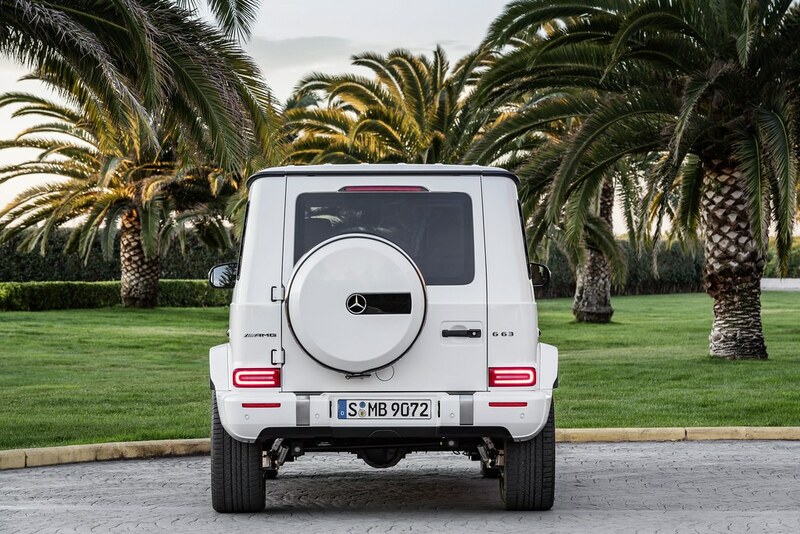 It helps to ensure that the G 63 is able to master even more demanding off-road stretches. The reduction ratio of the transfer case is now 2.93, i.e. considerably higher than in the preceding model (2.1). This assists moving off on extreme uphill gradients in particular, as the torque at the drive wheels is significantly increased. The new, intelligent multiplate clutch behaves like an automatically controlled locking differential. 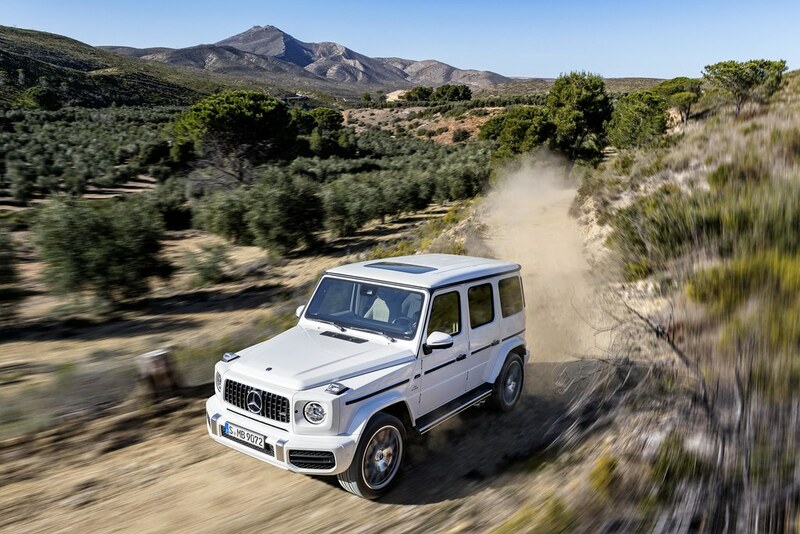 It ensures that the new G 63 remains manoeuvrable for longer when off-road. The advantage is that the driver has more scope before having to engage the differential locks manually. At the rear, the new axle is guided with four longitudinal control arms on each side and a Panhard rod. This makes normal driving on the road even more comfortable. When off-road, the rear spring compression of 82 mm and rebound of 142 mm plus the ground clearance of 241 mm to the rear axle gear help to ensure a safe ride even in extreme situations. 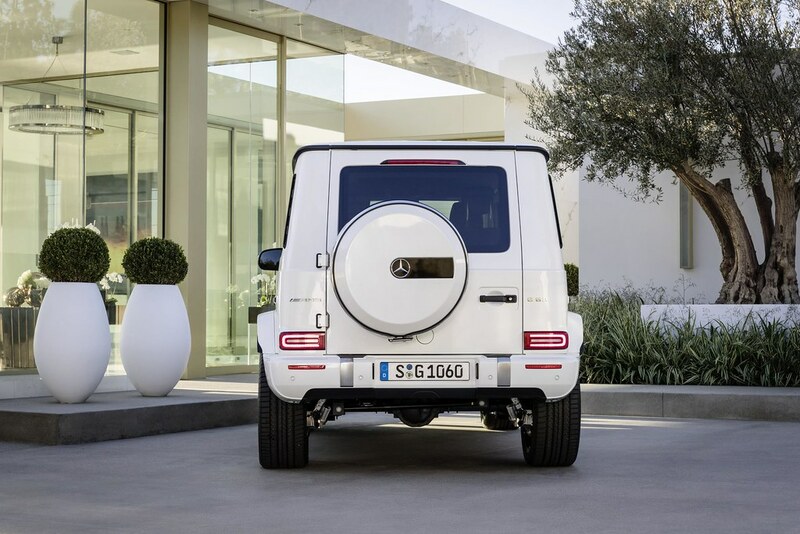 To reduce body roll, the G 63 has additional transverse stabilisers at the front and rear axles. Via a switch on the centre console, the driver can choose between three different sets of damping characteristics, namely “Comfort”, “Sport” and “Sport+”, and thus individually influence the driving experience from very comfortable to taut and sporty. 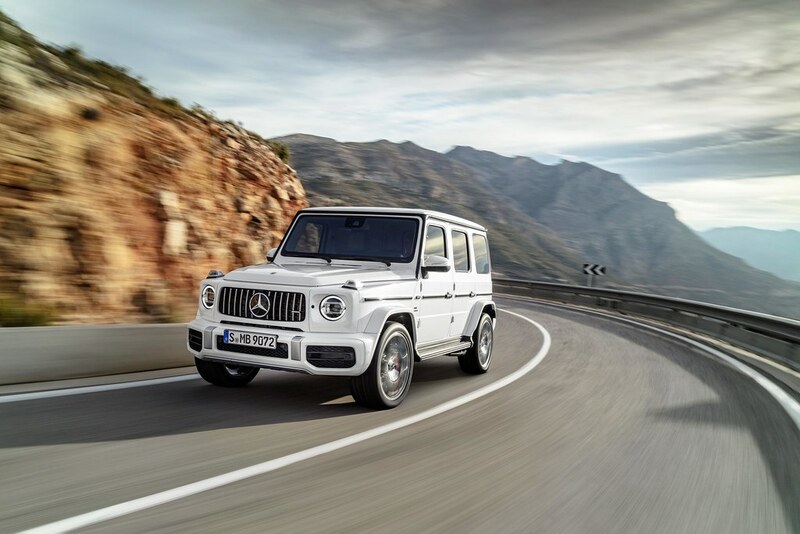 The electromechanical speed-sensitive steering installed in the G 63 for the first time has a variable ratio to ensure precise and authentic feedback. The steering servo assistance is reduced at high speeds, and continuously increases at low speeds. This means that comparatively little steering force is required at low speeds, and that the best possible control over the vehicle is maintained at high speeds. Steering power assistance is available in a choice of two modes “Comfort” or “Sport”. The relevant characteristics are automatically activated depending on the selected DYNAMIC SELECT driving mode, or can be personalised in “Individual” mode. In “Sport” the driver receives more direct feedback about the driving status. The roof is no longer spot-welded, but instead connected to the body structure by laser welding ‑ resulting in better surface quality and higher body strength. The flange width was retained, but optimised for the new welding method. For the first time, all the fixed windows are adhesive bonded to the body. This not only increases the torsional rigidity of the body, but also makes the window frames more resistant to corrosion. Unmistakable design features give the new AMG G 63 its unique appearance: the boxy silhouette, the proud bonnet, external door hinges, round headlamps, mounted direction indicators, robust door handles, muscular protective strips with inserts in high-gloss black with a silver AMG emblem, the exposed spare wheel on the rear door with a stainless steel cover and three-dimensional Mercedes star. 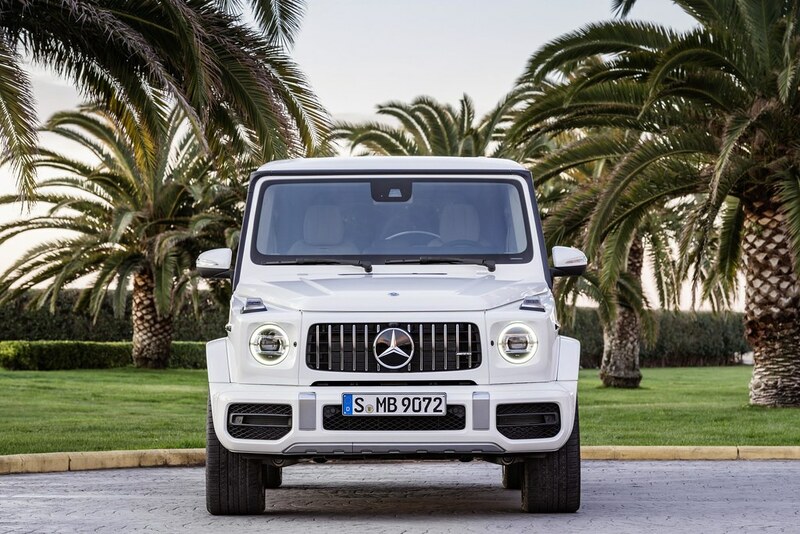 The front section of the G 63 is characterised by the AMG-specific radiator grille and the AMG bumper with large side air inlets and trim in matt iridium silver. The headlamps, indicators and tail lights are in LED High Performance technology as standard. This lighting consumes less energy and has a particularly long service life. 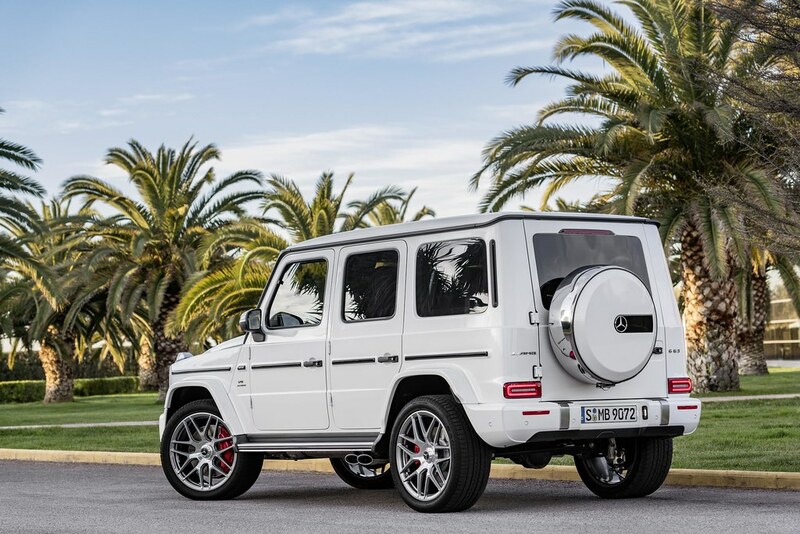 Other characteristics of the G 63 include the flared front and rear wheel arches, which create space for the larger, wider wheels. Running boards as standard, distinctive trim elements on the front and rear bumpers and metallic paintwork as standard round off the exclusive exterior. 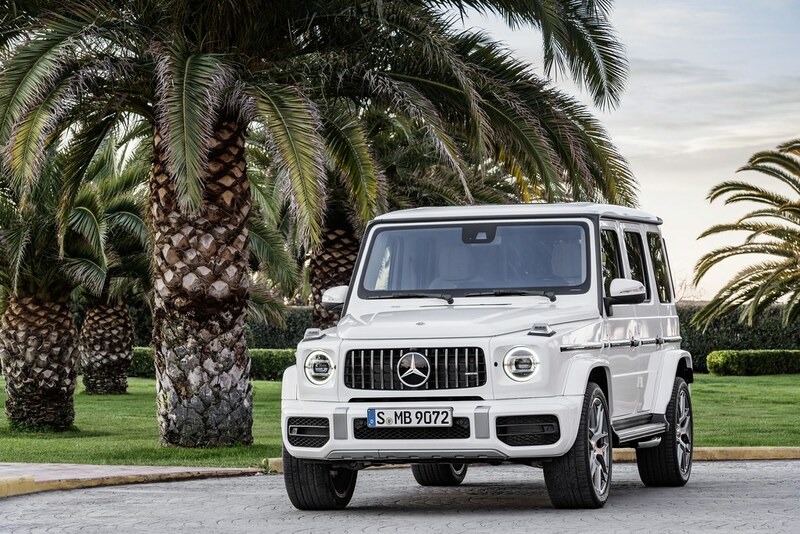 Other distinguishing features include the “V8 BITURBO” lettering on the front wings and the Mercedes-AMG G 63 model badge on the rear door. Red brake callipers, perforated brake discs and 22-inch wheels available for the first time round off the exterior design. The G 63 looks particularly striking with the optional AMG Night package. In this case the headlamps, tail lights, indicator lenses, rear window and rear side windows are dark-tinted. The obsidian black paint finish on the exterior mirror housings, the spare wheel ring and the trim in the front and rear bumpers, together with the black-painted underride guard, emphasises the confident appearance which is rounded off by matt-black 21 or 22-inch wheels. 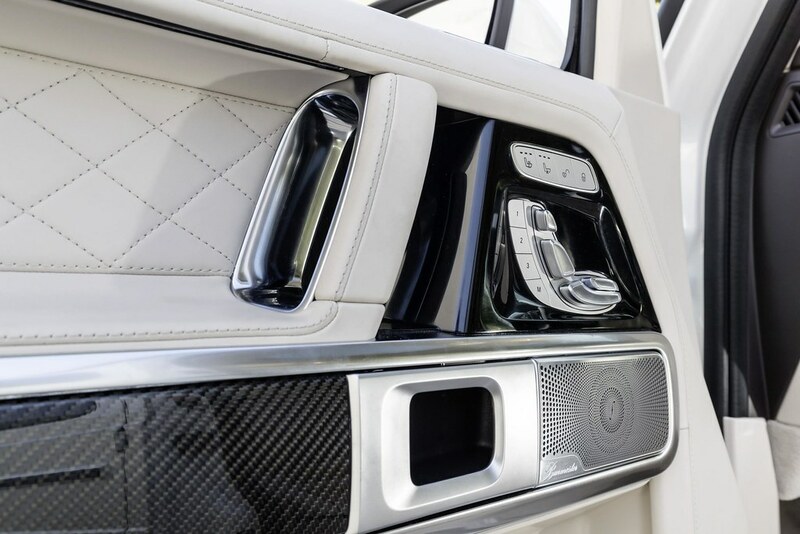 The new G 63 has been given a completely newly designed, modern interior that echoes specific exterior features. The shape of the round headlamps is reflected in the side air vents, and that of the indicators in the tweeters on the dashboard. 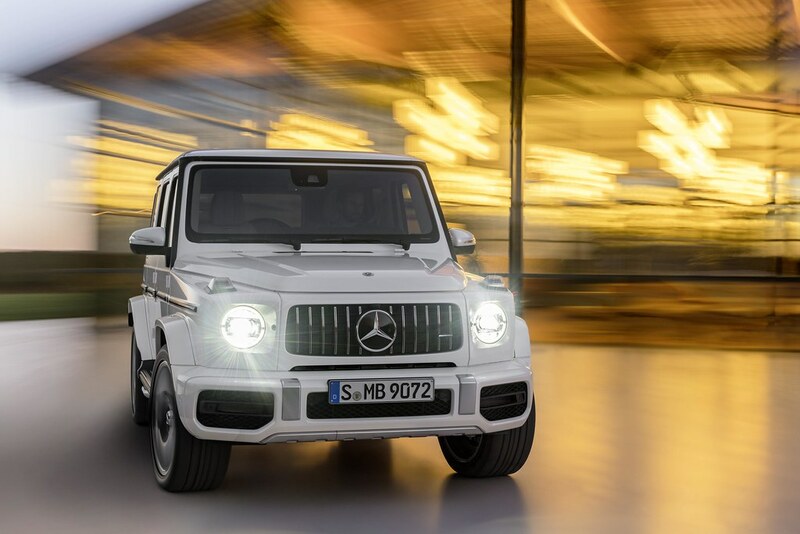 Hallmarks of the G 63 also include the grab handle in front of the front passenger and the chrome-highlighted switches for the three differential locks. The completely redesigned dashboard has analogue tubes as dial instruments as standard. Optionally the fully digital Widescreen Cockpit with virtual instruments directly in the driver’s field of vision and a central display above the centre console can be ordered. The two 12.3-inch displays visually blend into a single unit beneath a shared glass cover. The driver is able to choose from three different views – “Classic”, “Sporty” and “Progressive” – and access the required information individually. 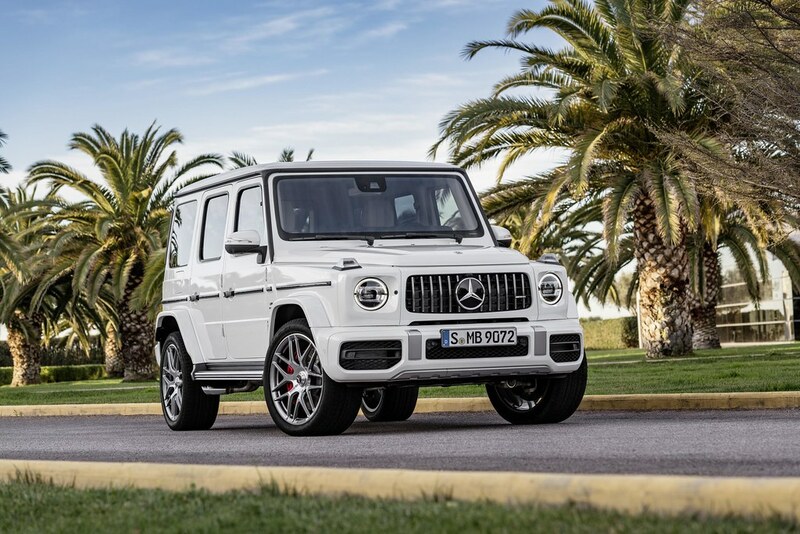 On market launch the new Mercedes-AMG G 63 will also be available as an exclusive “Edition 1” special model: the combination of equipment details turns the special model into the flagship of the range. The available paint finishes are magnetite black, obsidian black, iridium silver, mojave silver, selenite grey, designo graphite metallic, designo platinum black. designo mystic white bright, designo platinum magno and designo night black magno. As a discreet contrast the sports stripes along the vehicle sides are in matt graphite grey. The exterior mirror housings have a decorative red stripe. The AMG Night package with features in high-gloss black reinforces the muscular impression. The matt black 22-inch forged wheels in a cross-spoke design have red-painted rim flanges. The red highlights continue in the interior: They can be found on numerous interior features, for example as red contrasting topstitching on the dashboard support, centre console, door panels and rear seats. The front sport seats in black/red pepper nappa leather also show this striking colour. The sport seats feature a dynamic diamond pattern with red contrasting topstitching as standard. The carbon-fibre trim has highlights in red pepper, and the Performance steering wheel in DINAMICA microfibre with a flattened lower section is embellished with red contrasting topstitching and a red 12 o’clock marking. The new Mercedes-AMG G 63 will celebrate its world premiere at the Geneva Motor Show on 6 March 2018 – it will go on sale at the end of March, and first cars will arrive in August.